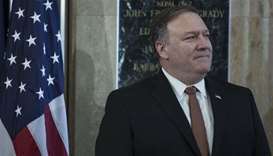 Newly-sworn US Secretary of State Mike Pompeo took less than 48 hours to indicate that, contrary to expectations, his view of the nearly year-long Gulf dispute, was the same as his little-mourned predecessor, Rex Tillerson. 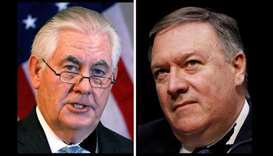 US President Donald Trump fired Secretary of State Rex Tillerson on Tuesday after a series of public rifts over policy on North Korea, Russia and Iran, replacing his chief diplomat with loyalist CIA Director Mike Pompeo. 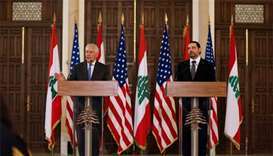 Hezbollah's involvement in regional conflicts poses a threat to the security of Lebanon and is a destabilising influence in the Middle East, US Secretary of State Rex Tillerson said on Thursday. 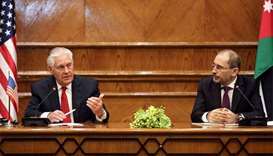 Rex Tillerson, who was speaking during a visit to Jordan to sign a five-year $6.4bn aid package that extends US support to a key Arab ally, said President Donald Trump would decide when to announce the peace plan. US Secretary of State Rex Tillerson met Syrian opposition negotiators in Jordan Wednesday for closed-door talks in the wake of a January peace summit hosted by regime backer Russia. 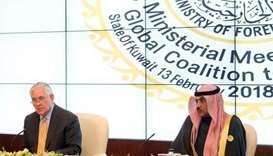 Rex Tillerson, in Kuwait for a meeting of the US-led coalition fighting the Islamic State group, said the United States was working to settle the Gulf dispute. 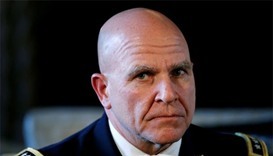 H. R. McMaster's talks with Erdogan's spokesman Ibrahim Kalin in Istanbul come days ahead of an expected visit to Turkey by US Secretary of State Rex Tillerson. 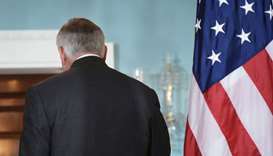 US Secretary of State Rex Tillerson and his Russian counterpart Sergei Lavrov discussed the ongoing crises in Syria, North Korea and Ukraine in a call on Wednesday, US State Department spokeswoman Heather Nauert said. US Secretary of State Rex Tillerson on Friday dismissed reports that the White House is weighing a plan under which he would be replaced by CIA Director Mike Pompeo as "laughable." 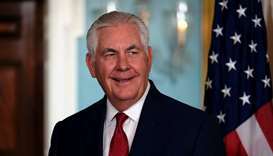 The White House has a plan to force out Secretary of State Rex Tillerson and replace him with CIA chief Mike Pompeo within weeks, the New York Times reported Thursday. 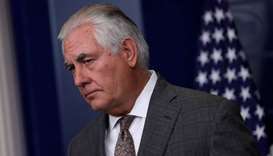 US Secretary of State Rex Tillerson called the Myanmar military operation against the Rohingya population "ethnic cleansing" and said the United States would consider targeted sanctions against those responsible. A group of about a dozen US State Department officials have taken the unusual step of formally accusing Secretary of State Rex Tillerson of violating a federal law designed to stop foreign militaries from enlisting child soldiers, according to internal government documents reviewed by Reuters.